UPDATE: An attorney for the Philadelphia City All-Star Football Game executive committee alleges Brian Fluck embezzled and misappropriated funds in his role as committee president. 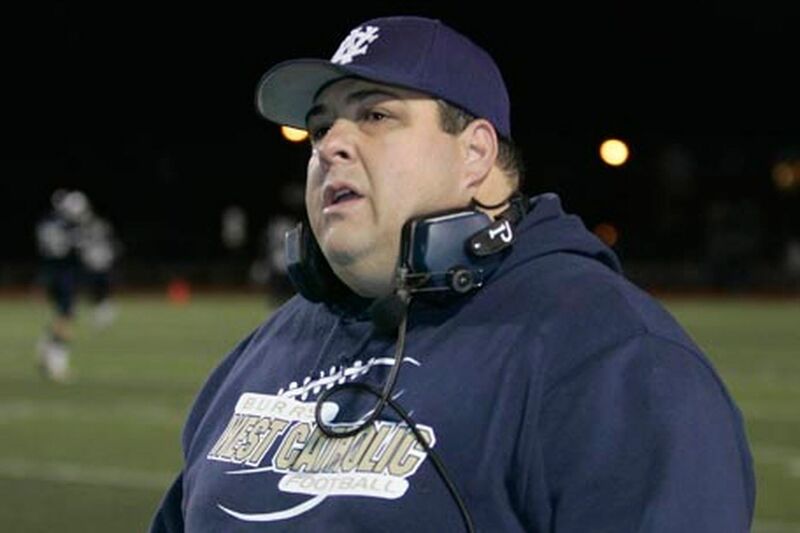 Brian Fluck, the former athletic director and current head football coach at West Catholic High School, has stepped down as president of the executive committee of the 44-year-old Philadelphia City All-Star Football Game amid an internal investigation into missing funds. Fluck has been the West Catholic head coach since 1999 and is one of the most accomplished coaches in Philadelphia Catholic League football history. He was placed on paid administrative leave by the school this week pending inquiries, according to a West Catholic official who asked to not be named. Both West Catholic president Paul Colistra and Ken Gavin, spokesperson for the Archdiocese of Philadelphia, declined to comment. In an interview Wednesday in his office at West Catholic, Fluck confirmed that he stepped down as president of the game’s executive committee in early January, but would not comment on the group’s finances. “They won’t let me talk about it,” he said. Doug Macauley, a former athletic director and coach at Dobbins Career and Technical Education High School and vice president of the game’s executive committee, said he could not comment on Fluck’s exit as president. Board members of the all-star game, who asked not to be named, said more than $50,000 could be missing. According to several of the organization’s 13 board members, questions arose in December about scholarship money the group had awarded to high school players and unpaid bills for services that spanned years. Then, in early January, according to board members, the executive committee concluded that money had been missing from the accounts dating back to 2016. More recently, one board member said, they were told money might be unaccounted for as far back as 2008. According to several board members, Fluck’s name was the only one on the committee’s bank account, and he would have been the only person able to make withdrawals. Frank Natale, the South Philadelphia High School football coach and athletic director and a member of the game’s board, said he received a call in December from a spokesperson for Ampro, an apparel company in Clifton Heights, informing him that the company hadn’t been paid nearly $10,000 for jerseys it supplied for last year’s all-star game, played May 19 at Northeast High School. The public schools won that contest, 38-20. When reached last week, an Ampro employee said the company would not discuss account information. Natale, who has done business with Ampro for South Philadelphia High’s apparel, said he relayed the concern to Macauley. The Philadelphia City All-Star Football Game, according to several board members, finances its operation with funds from game proceeds, donations, association dues, sponsorships by local businesses, and other fund-raising efforts. Last week, a former all-star game player, now a sophomore at a local college, and his mother said they needed to make several phone calls and send multiple letters to the executive committee to receive promised scholarship money. The former South Philadelphia High standout finally got a $500 award — only after extraordinary help from Natale — months into his freshman year at college. He asked that his name not be used. A board member said that case was likely not unique and that more athletes have had difficulty receiving scholarships or did not receive them. Fluck (pronounced “Fluke”) was the athletic director at West Catholic from 2007 to 2016. He was a standout football player when he graduated from West Catholic in 1988, and he played in the city all-star game and served as an assistant coach and head coach. He played college football at Temple. During his tenure as West Catholic coach, Fluck has won 169 games and 16 championships, and coached more than 50 All-City players, including three who played in the NFL. He has won nine Catholic League football championships, six city championships, and a state championship in 2010. Fluck and nine other West Catholic graduates were inducted into the school’s Hall of Fame in 2018. It is unclear whether the city all-star game will be played this season. The rosters are typically chosen in February.